The Maharashtra Common Entrance Test (MHT CET 2020) will be followed by certain pattern and norm and candidates will be required to adhere while appearing for the MHT CET 2020 Examination. These so-called MHT CET Exam Patten 2020 are formulated by the Directorate of Technical Education (DTE). Candidates, while preparing for the MHT CET 2020 Examination, will be benefitted with the awareness of the MHT CET Exam Pattern 2020. The Exam Patten for MHT CET 2020 includes Question Paper set up, Answering mode, Marking Scheme, and so on. Acquaintance with the MHT CET 2020 Exam Pattern will help candidates in framing their study routine in a specific direction. 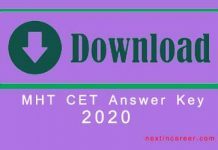 In this article, read about the MHT CET Exam Pattern 2020, the mode of MHT CET 2020 Examination, Duration, Type of questions, Sections, Number of Questions, Marking Scheme, and so on. 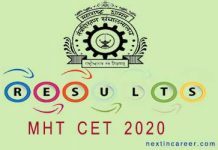 Exam Pattern of MHT CET 2020 will be held online i.e. computer-based standardized test. Candidates who are going to be appearing in the MHT CET 2020 can expect the following different papers. Physics, Chemistry, Mathematics and Biology. Candidates can choose to appear in either of the exams, given they clear the eligibility criteria. Moreover, there will be three Papers, i.e. Question Paper will contain 50 questions in Paper I; 100 questions in Paper II; and 100 questions in Paper III. Each section will be worth a total of 100 marks. Each question will have 4 options given corresponding to it. Candidates will have to select one out of the rest. Each section will cover the duration of 1 and a half hours. Questions will be objective type only. Questions will be asked from 4 different sections, i.e. Physics, Chemistry, Mathematics and Biology. Physics and Chemistry sections will comprise of 100 questions, i.e. 50 each. Biology will cover 100 questions, with 50 questions from the Botany section and 50 questions from the Zoology section. Mathematics section will cover the remaining 50 questions. Each correct answer will carry an addition of 2 marks in Mathematics (Paper I) and 1 mark for the remaining papers. If any question is left unanswered, then no marks will be either added or deducted. MHT CET Marking SchemeThe MHT CET Exam Pattern 2020 is laid down below.It is to be noted that around 20% of the syllabus will be asked from 11th standard and the remaining 80% of the syllabus will be asked from 12th standard. Candidates are thus advised to be well versed with the 12th standard portions for better performance. 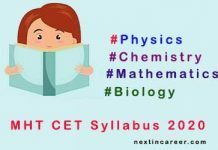 MHT CET Preparation Tips 2020 Follow these MHT CET preparation tips 2020 mentioned below to know how to efficiently prepare for the examination. Be clear with the MHT CET Syllabus before starting with the MHT CET Preparation. Prepare a good timetable for each day. This will help the candidate manage time. Solve NCERT Books and both available sample papers and mock tests. Acquaint with the MHT CET Exam Pattern 2020. Understand each concept and make notes on each topic. Eat healthy food and have a normal sleeping pattern during the exam preparation. Sections: There will be three sections; namely, Physics, Chemistry, Mathematics. Candidates can opt for Biology paper as well. Negative Marking: There will be a 1 mark deduction for every wrong answer. Language: English for Paper I and English or Hindi or Marathi for Paper II and III.